Republished from European Space Agency. Original post date: 19 December 2008. View legend. Image previews of the world map (hi-res jpg | tiff). ESA’s global land cover map, which is ten times sharper than any previous global satellite map, is now available to the public online from the GlobCover website. It is the highest resolution land cover map that has been completely validated ever released. Sixteen experts validated the map using more than 3,000 reference land cover points and showed it had an overall accuracy of 73% weighted by area for its 22 land cover classes. The map’s legend was developed using the United Nation Food and Agriculture Organisation’s (FAO) Land Cover Classification System (LCCS). The map was generated using 19 months worth of data from Envisat’s Medium Resolution Imaging Spectrometer (MERIS) instrument working in Full Resolution Mode to provide a spatial resolution of 300 m. Data were collected between December 2004 and June 2006.A consortium of specialists worked to process the map, including Medias France, Germany’s Brockmann Consult and Belgium’s Université catholique de Louvain. These data are useful for many applications, including modelling climate change extent and impacts, conserving biodiversity and managing natural resources. The map has been downloaded by more than 4 000 people since October 2008. The GlobCover project is part of ESA’s Earth Observation Data User Element (DUE). An international network of partners has worked with ESA on the project, including the United Nations Environment Programme (UNEP), FAO, the European Commission’s Joint Research Centre (JRC), the European Environmental Agency (EEA), the International Geosphere-Biosphere Programme (IGBP) and the Global Observations of Forest Cover and Global Observations of Land Dynamics (GOFC-GOLD) Implementation Team Project Office. The GlobCover Land Cover product is the highest resolution (300 meters) Global Land Cover product ever produced and independently validated. 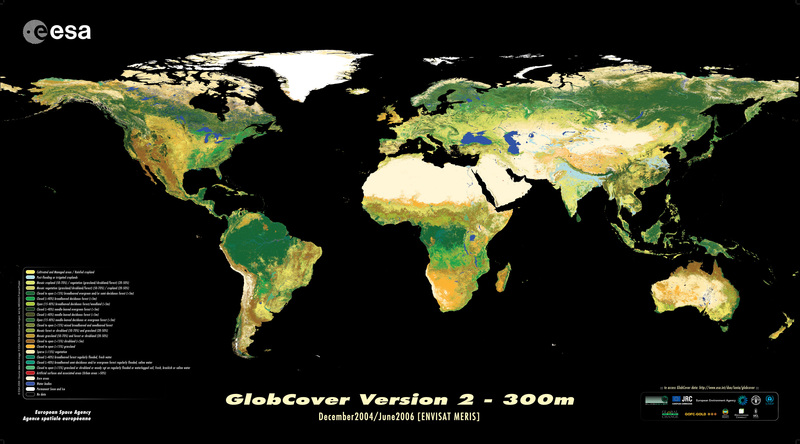 The GlobCover Land Cover product is based on ENVISAT MERIS data at full resolution from December 2004 to June 2006. The GlobCover Land Cover product has been developed in partnership with EEA, FAO, GOFC-GOLD, IGBP, JRC and UNEP. 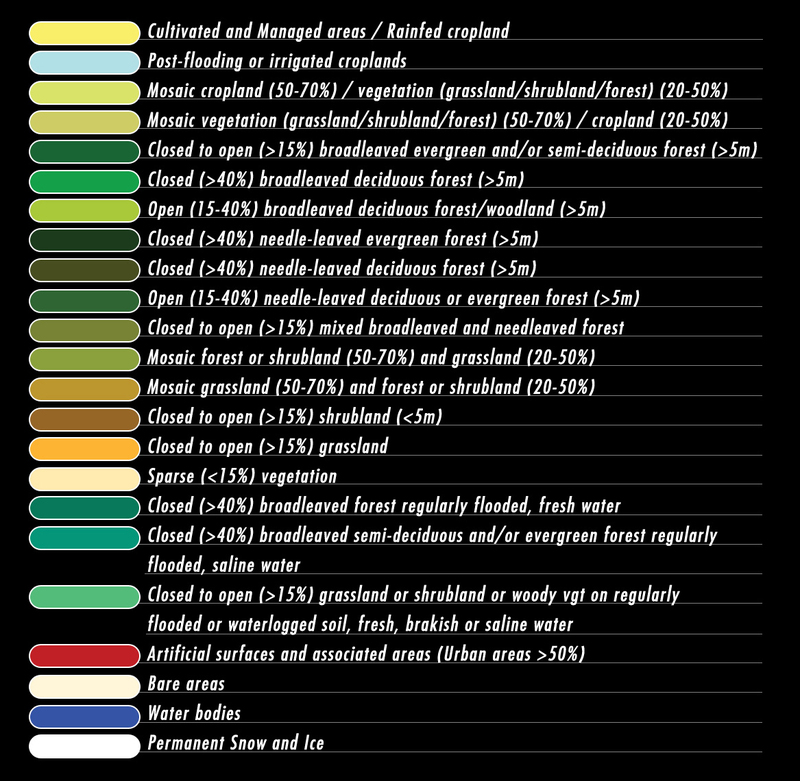 The GlobCover Land Cover product is labelled according to the UN Land Cover Classification System.